The long-awaited untethered jailbreak of iOS 6 finally arrived yesterday via the evasi0n release, and while some folks rushed to get their grubby mitts on the hack, others waited patiently to see if any quirks popped up to spoil the fun. The team is reportedly working on a fix, but if you don’t rely on Weather — or would really love to grace that iPad with some climatological goodness — then you might decide not to wait and jump into the jailbreak anyway. You certainly wouldn’t be alone. Evasi0n has been downloaded more than 1.7 million times in the past 24 hours. *If you jailbroke an older A4-based device via the tethered jailbreak for iOS 6.1, don’t follow this. You can convert that into untethered by installing “evasi0n 6.x Untether” from Cydia. ** Warning: Issues may or may not crop up for users who updated to iOS 6.1 over the air. 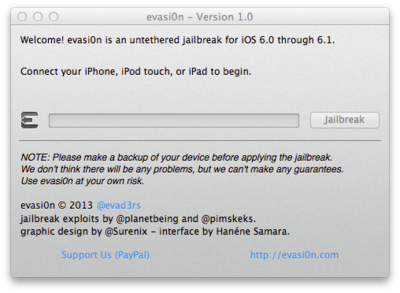 The Evad3rs team warns against updating this way for the evasi0n jailbreak, though some users have reported success. If you’ve already updated OTA, proceed with caution. If you haven’t yet, use iTunes to download and update the firmware. If you downloaded apps directly to your device, then pull them into iTunes via Transfer Purchases. And don’t forget your camera roll, especially if you don’t use Photo Stream. Even if you do, transfer them anyway, for safekeeping. Note: Syncing your device to iTunes doesn’t bring them in, so use iPhoto, Aperture, Adobe Bridge or other photo programs to import them. Update your firmware to iOS 6.1 via iTunes. Backup your device using iTunes or iCloud (preferably iTunes — tethered backup is safer and faster). Make sure the lock passcode on your device is off, and don’t plan on using iOS or doing iTunes-related tasks until the jailbreak is done. Before you do anything else, make sure iTunes (or Xcode, if you have it) is shut down. Plug the device into your computer using the USB cable. A window will appear on your computer confirming that evasi0n has detected the device, and a Jailbreak button will become active. Hit the button. 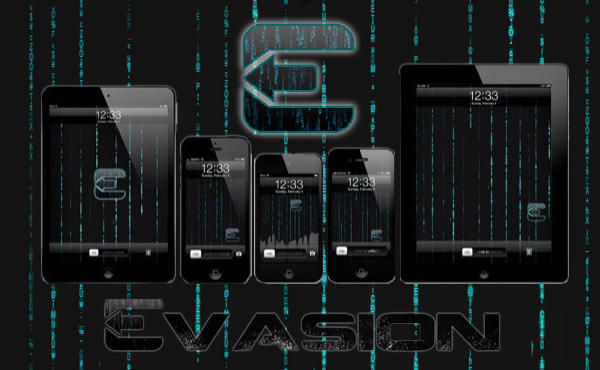 You’ll see a status indicator as evasi0n prepares the jailbreak data, injects the data, reboots the device, uploads Cydia, and its packages list, etc. When it’s done, a screen will pop up on your monitor asking you to unlock your device. Once you go into your iPhone, iPad or iPod touch, look for a new app called “Jailbreak.” Tap the icon once. Let the jailbreak do its thing. You’ll see status messages on the desktop indicating injection of jb data and Root Filesystem successfully remounted on the evasi0n tool, etc. Your device may reboot several times, and at some point, you’ll see a “Done!” message and the white evasi0n logo amid more reboots and blinking. Don’t worry, this is normal and totally automated, so go grab a glass of water or a snack. This can take a little while. When the process is finished, you’ll see the Cydia icon ready and waiting for you on your homescreen. As you can see, it’s not a difficult procedure, but you always need to be extra careful whenever you mess around with system files. No one wants a bricked device. As for length, the jailbreak can take about 15 minutes to half an hour, so patience is key. (So is backing up!) But if you do get hung up somewhere, don’t panic. Just restart the program, reboot your i-device (hold down Power and Home) and then start again. Have you jailbroken your iOS device, or are you planning to? If you have, would you have waited if you knew about the Weather app glitch beforehand? Tell us about your experience with evasi0n, and if you have any hot tips for Cydia packages, leave them in the comments below.